Signal Design chip that was Field Programmable, with presets of course. Innovation Par-Excellence. 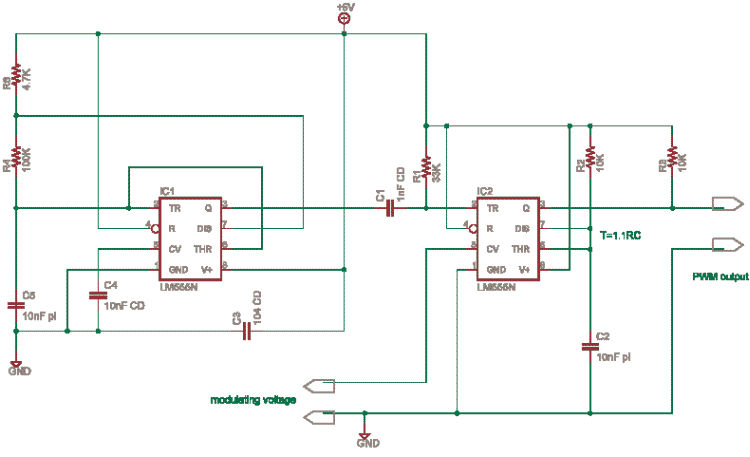 This circuit can control the pulse width or on-duration by a control voltage. This makes it useful for close loop control systems in energy or heating control. Pin 5, used for filtering in noisy environs. By imposing a voltage at 5, it is possible to vary the timing independent of RC. The CV can be from 45% to 90% of Vcc in Monostable mode. Control Voltage1.7V to Vcc in astable mode. This control gives immense possibilities for making Musical Instruments and Sound Effects. It has been popular way in which Bells, Metronomes and Electronic Organs have been made by Hobby DIY Enthusiasts.